Meet Ana Eberly: a 32-year-old single woman with no dependents on social assistance in Vancouver, British Columbia. She represents the many people in Canada in core housing need facing multiple barriers to financial stability and full participation in society. Ana receives disability support for a cognitive disability which prevents her from maintaining full or part-time employment; as a youth, Ana felt a sense of contribution and belonging through her participation in extra-curricular and community programs, but since aging out of these initiatives, she finds herself feeling increasingly isolated. Ana has secured co-op housing in the Downtown East Side of Vancouver, at a below-market rate of $739 a month. With shelter funding from income assistance capped at $375 in British Columbia and a median rental rate for a one-bedroom apartment of $1,223 in Vancouver, Ana is unable to improve her housing situation, as is the case with many in her city, working or not; even with her government benefits, Ana would be on the street were it not for her securing one of the limited spaces in co-op housing. Despite Ana’s access to certain government transfers, the high cost of rent takes up 60% of her total monthly income putting her at an increased risk of homelessness. Any additional monthly expenses incurred directly affect her ability to buy nutritious food, which is essential to maintaining cognitive stability. Ana is covered under a BC pharmacare program for people with psychiatric issues, though certain treatment options remain beyond the scope of the insurance plan. While her psychiatrist has recommended certain medications, she cannot fill these prescriptions as many non-generic medications are rejected by her pharmacare plan. $7,427.00 below the poverty line (annual after-tax low-income measure). Does not include additional expenses such as clothing, out-of-pocket health expenses, recreational activities, furnishings, etc. 3 million Canadian households are precariously housed, paying 30% or more of their total household income towards the cost of shelter. An additional 50,000 of people living in Canada experience hidden homelessness, a form of precarious housing that typically involves couch surfing, living in a car, or other forms of unstable housing. Almost 1 in every 5 renting households in Canada spend over 50% of their income on rent, putting them at a higher risk of experiencing homelessness. 1 in 4 people experiencing homelessness identify as Aboriginal or First Nations, and 28-34% of shelter populations are Indigenous, a great overrepresentation given that they account for only 4.3% of people living in Canada. In a country as rich as ours, it is unacceptable that 3 million Canadians spend over 30% of their income on rent. Add your voice to over 12,000 individuals, organizations, and government representatives who support Dignity for All’s comprehensive, rights-based anti-poverty plan. Together we can work towards a poverty-free Canada. Check out Dignity for All’s one-pager on Housing and Homelessness for more information. Support the Dignity for All Call to Action. Add your name or your organization to the thousands of others who want federal leadership and action for a poverty-free Canada. 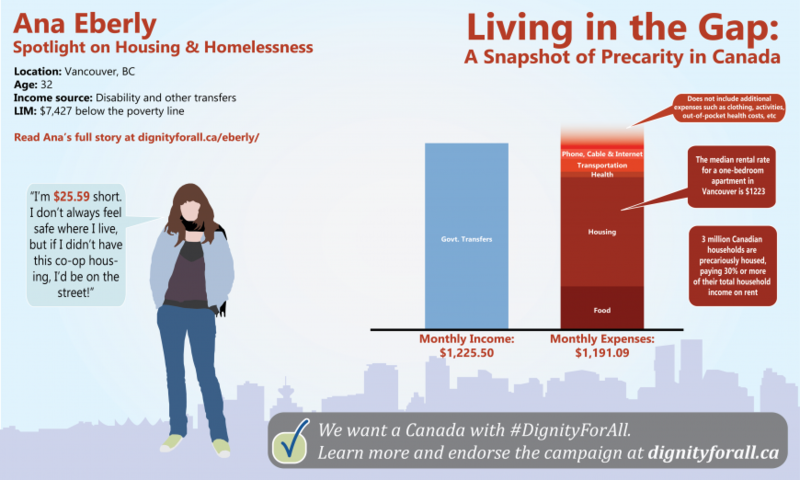 Dignity for All: The Campaign for a Poverty-Free Canada was founded by Canada Without Poverty and Citizens for Public Justice in 2009.